Fun, feminine and pretty necklace for Valentine’s Day or everyday for a loved teenager (or teenager at heart!). This necklace features a hand-stamped "LOVE" on a textured sterling silver charm. 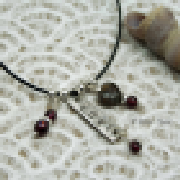 I sawed the shape out of a sterling silver sheet, hammered the texture, stamped "LOVE", and then added a stunning combination of deep red garnet beads, a natural, highly polished stone heart, and silver beads. The silver "LOVE" was oxidized, buffed and polished to bring out the pattern’s detail. The necklace is 16" in length on a cotton cord with a sterling silver lobster claw clasp. 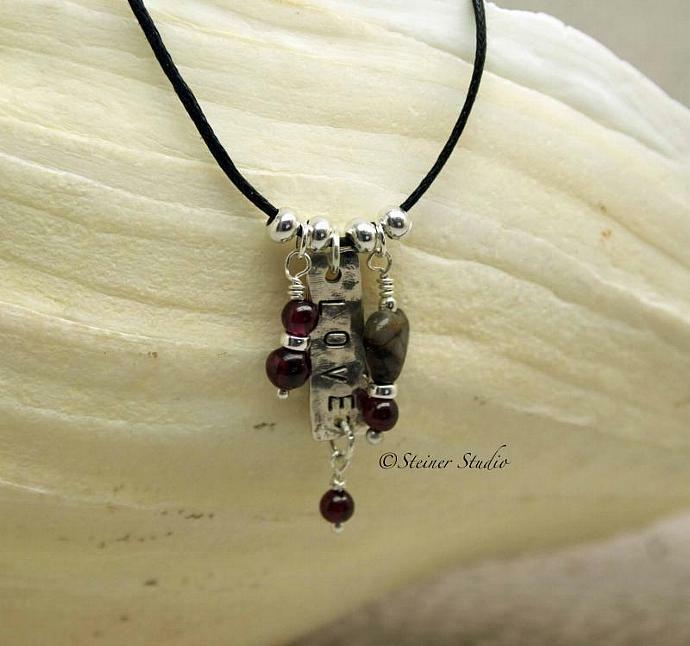 Materials used: sterling silver sheet sterling silver wire garnets natural stone sterling silver beads and cotton cord.